After I heard everyone praising this pizza place as some of the best, if not the best, in the city, I had to try it out. My first impression was this pizza is amazing. However, I wasn't sure if I loved their deep dish pizza or just deep dish pizza in general. After munching on a few more pieces, I realized that the different components were delicious, the toppings excellent, but the ratios were off. I thought they had way too much cheese for the deep dish pizza and also not enough seasoning in the somewhat tangy tomato sauce. I did become a little sick to the stomach after eating the buttery crust, but it was still a better tasting crust then most places. I definitely suggest trying this pizza before some of the other popular chains in the city. This is one of the first times I have had pepperoni deep dish pizza. It was different and delicious! I have heard that it is sometimes difficult to get the right amount of meat on the pizza, but mainly it is difficult to cook the thinly sliced pepperonis without burning them. Well, they found an excellent balance at the Art of Pizza. The tomato sauce was a nice tangy and chunky base, but lacked some of the stronger seasoning I have tasted in other places. The crust was a nice combination of the other pizza places in Chicago... I swear they combined the best aspects from the other deep dish legends. They made it crispy like Uno's and buttery like Lou's. It was still too thick making it too filling. Overall the pizza was tasty though. 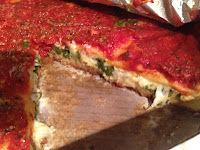 Everyone in the city loves the huge sausage patty underneath all the cheese and tomato sauce of a deep dish pizza. I find this to be a Chicago staple and they do a good job with the taste and cooking of sausage. I did wish it had more spice to it, but all in all, it wasn't undercooked like I have experienced at Gino's. A great vegetarian option! The main difference in this spinach deep dish is definitely the use of only one type of cheese and the spinach flavor that overwhelms everything else. For the first time, I can actually taste spinach (which in my opinion, is a good thing). The crust and sauce are similar to the descriptions listed above. I usually don't like ordering thin crust pizza at a place when deep dish pizzas are coming... but I am glad we did. The hawaiian pizza had ham, green peppers, and tons of pineapple. The sweet pineapple and salty everything else was a great combination. The crust was plain, but I happen to love plain tasting crusts. I enjoyed eating the pizza and loved it even more when cold. - Do order out... the restaurant isn't huge and a lot of people consider this some of the best pizza in Chicago, so their lines are always long. - Do order the spinach deep dish. I consider it one of the better ones in the city because you can actually taste the spinach! - Don't come here if you are not willing to wait around 45 min to an hour for the pizzas to cook. The deep dish process is long, but worth it. Awesome blog! Is there an email we can contact you at? hey... glad you like the blog! You can email me at joe@eatingforsanity.com so just send me a message and Ill get back to you!